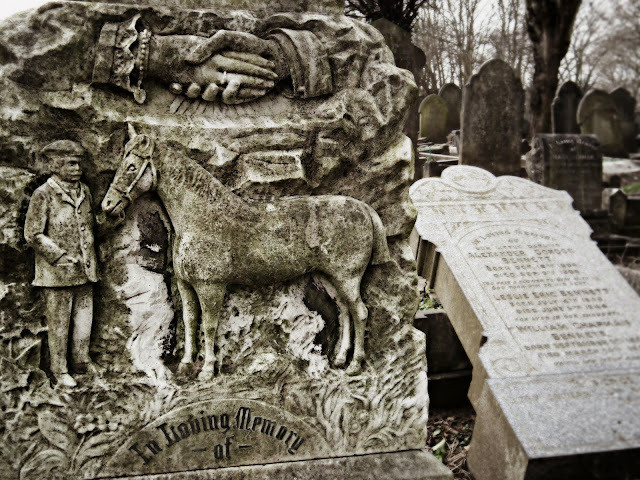 The horse is probably a red herring (perhaps he was a betting man); George Blackwell was a brick maker, married to Jane, the beloved wife who put up his headstone and with whom he had at least six children. Although born in Southall he seems to have spent most of his adult life in Edmonton and Haringey. He was probably reasonably successful – as well as owning his own home at 49 Vernon Road, by 1905 he also owned number 37 Vernon Road and 121 Compton Road, both properties rented out as rooms to lodgers. Jane Blackwell had help managing her lodging houses, Mary Ann Gardiner who also lived on Vernon Road, at number 31, cleaned and collected rent for her as she was presumably quite busy enough looking after her numerous offspring. 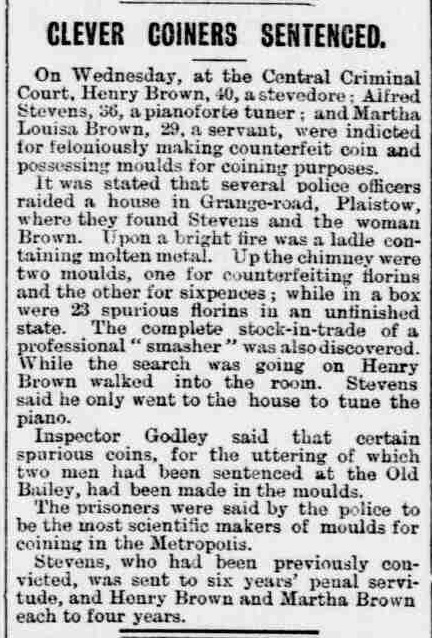 We know these sparse details from the lives of the Blackwell’s because on 6 February 1905 two of their lodgers appeared at the Old Bailey accused of coining and counterfeiting. In November 1904 Elizabeth Willis (née Gray), 33 years old and her 20 year old brother William rented two rooms, the front parlour and the kitchen, at Compton Road, from Jane Blackwell. A month later she moved them to two upstairs rooms at Vernon Road for a rent of six shillings a week. On 4 January 1905 William Gray was in Fore Street, Edmonton, buying cigarettes at at least two tobacconists. From Gambrill’s he bought 2 penny’s worth of Navy Cut tobacco, offering a dirty shilling as payment. At Jones’ he bought a penny packet of Woodbines, again offering a dirty shilling in payment and getting his 11 pence change. Mrs Jones waited until he had gone to bite the shilling but once she had she raced out of the shop and caught up with Gray and his sister 300 yards down the road. "Give me back my 11d, you can keep the fags,” she told the young man. Instead of returning her coppers Gray tried to pay her off with a two shilling piece. At this point Mr Jones arrived from the shop, grabbed Gray and started yelling for the police. PC John Dunford left Jones holding Gray and grabbed Willis. Both were taken first to Edmonton Police Station where they were searched and then to Stoke Newington station where they were charged the search having revealed one counterfeit shilling wrapped in tissue paper on Gray and three on Willis. A search of their rooms at 37 Vernon Road revealed a further 31 counterfeit shillings as well as materials for making the coins. A week later, 11 January, 41 year old Henry Brown was arrested at his lodgings in Newton Road, Tottenham and charged with coining. He claimed to barely know Elizabeth Willis “I met this woman in the street, went home with her, and slept with her occasionally. The last time was just before she was locked up; I read about it in the 'Tottenham Herald'.” At the trial various witnesses placed Brown regularly in the company of Willis and Gray at both Compton Street and Vernon Street. 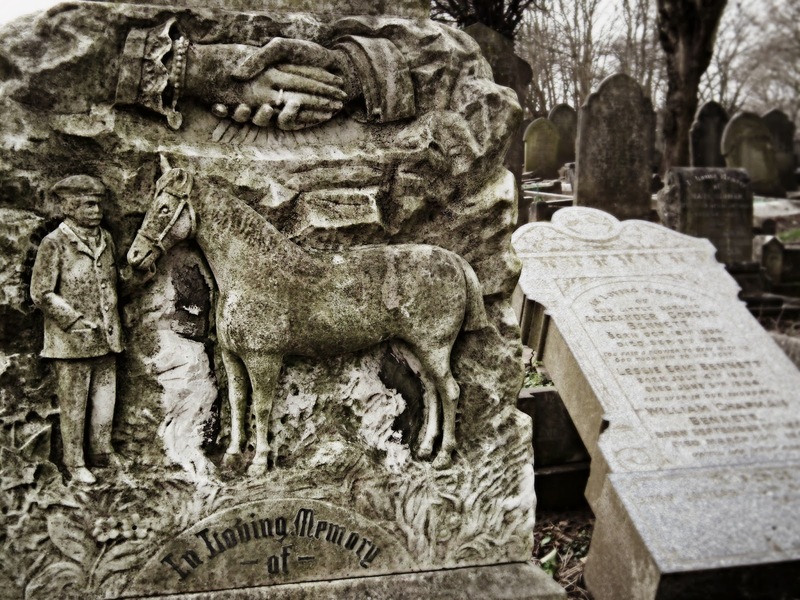 Residents of the lodging houses talked about ‘white stuff’ appearing in the privies after they had been used by Gray and by Brown, plaster of Paris dust from the moulds used to cast the fake coins. Brown continued to maintain his innocence, he told the court "I have been very intimate with Lizzie Gray; I visited her several times at her house. On no occasion of visiting her have I seen any counterfeit coins, or the making of them." William Gray backed his story, saying that Brown knew nothing of the counterfeiting operation and taking all the blame on himself. Whether he was nobly but misguidedly trying to save his friend or whether he was intimated by Brown we will never know. Elizabeth Willis pleaded guilty to passing false coins, she was given 12 months hard labour. Her brother was given 18 months. Brown, who had challenged all the witnesses while the others had kept silent, was not believed by the jury or the judge – he was pronounced guilty by one and given a four year sentence by the other. Quite rightly as it turned out.